San Francisco, Calif. – April 20, 2016 – Today marks the launch of a new My Little Pony bundle that includes comics valued at over $300 and even has the entire first bundle at a pay-what-you-want price for readers who are new to the series. The Humble Comics Bundle: My Little Pony 2 presented by IDW will run from now until Wednesday, May 4, 2016 at 11 a.m. Pacific Time. Customers can pay what they want for My Little Pony: Friends Forever, Vol. 1-3; My Little Pony: Pony Tales, Vol. 1-2; My Little Pony: Friendship is Magic Vol. 1-5; My Little Pony Cover Gallery #1, My Little Pony Art Gallery, My Little Pony: The Magic Begins, My Little Pony: When Cutie Calls, and My Little Pony: Animated, Vol. 3: The Return of Harmony. Those who pay more than the average price will also receive My Little Pony: Adventures in Friendship, Vol. 1-4; My Little Pony: Friendship is Magic, Vol. 6-7; My Little Pony: Friends Forever, Vol. 4-5; and My Little Pony: Art is Magic. In addition, customers who pay $15 or more will receive all of the above, as well as My Little Pony: Friendship Is Magic, Vol. 8-9; My Little Pony: Friends Forever, Vol. 6; My Little Pony Holiday Special;My Little Pony: Pageants & Ponies; My Little Pony: A Canterlot Wedding; My Little Pony: Equestria Girls Holiday Special; and My Little Pony: Equestria Girls. Additionally, if customers want a physical book, anyone who pays $25 or more will also receive a physical copy of a specially packaged My Little Pony book exclusive to the bundle. These comics usually cost as much as $300. At Humble Bundle, though, customers choose their price! 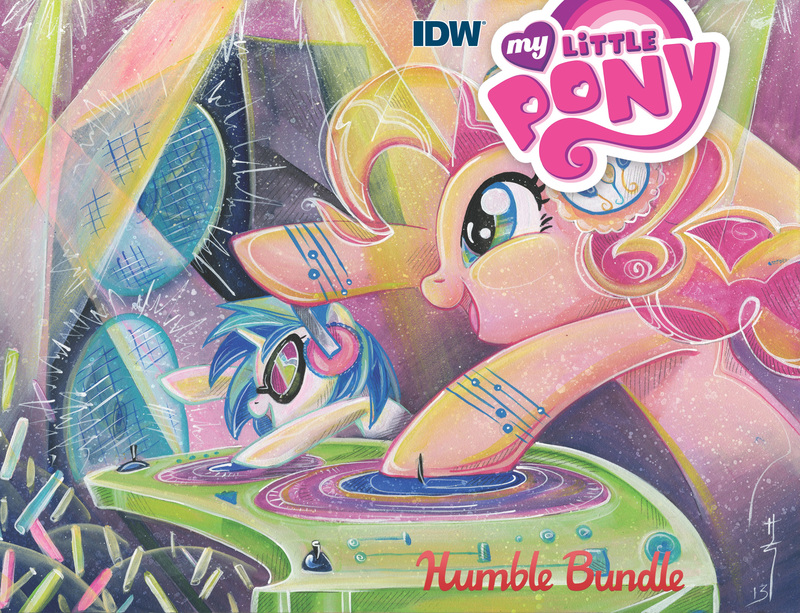 To see the full bundle, visit https://www.humblebundle.com/books/my-little-pony-comics-idw. As with all Humble Bundles, customers can choose how their purchase dollars are allocated, between the publisher and charity. The Humble Comics Bundle: My Little Pony 2 presented by IDW supports the Hasbro’s Children Fund, which is dedicated to empowering childhood by bringing “the sparkle of Hope, the joy of Play and the power of Service” into the lives of the children who need it most.